Do you sell pens either online or via a retail outlet? Or maybe you're looking to brand Swanneck Pens with your logo and colours for your school, company or other organisation? 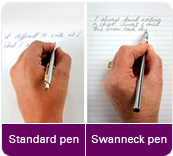 If you'd like to find out more about purchasing larger volumes of Swanneck Pens on wholesale terms, we'd be delighted to hear from you. Please also contact us if your interested in stocking our new Carioca superwashable range, we will then be able to quote the wholesale/school prices. See carioca superwashable range on amazon.uk - schools receive 15% discount.